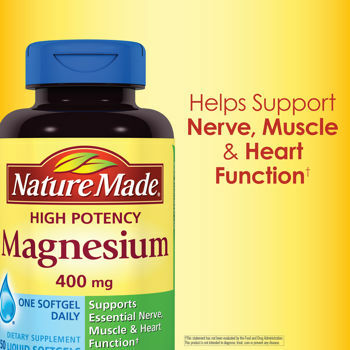 Nature Made® Magnesium 400 mg - 150 Liquid Softgels SALE! Individuals with certain health concerns or with decreased ability to absorb food and nutrients may need extra magnesium. These individuals may include people with digestive or kidney problems, alcoholism or poorly controlled diabetes. Older adults and individuals taking certain diuretics, antibiotics and cancer medications may also need extra magnesium. It is important to talk to your preferred health care professional about your magnesium needs and proper supplementation. Green vegetables such as spinach are good sources of magnesium because the center of the chlorophyll molecule (which gives green vegetables their color) contains magnesium. Some legumes (beans and peas), nuts and seeds, and whole grains are also good sources of magnesium. Other Ingredients: Medium Chain Triglycerides, Gelatin, Glycerin, Water, Soy Lecithin, Colors Added, Yellow Beeswax. Caution: Do not exceed one softgel daily unless recommended by your healthcare professional. Product may cause gastrointestinal intolerance. Consult a physician before use, if you have kidney disease or if you are taking prescription medication. Do not take with other products that contain magnesium. 1 Fulgoni VL, Keast DR, Bailey RL, et al. Foods, fortificants, and supplements: where do Americans get their nutrients? J Nutr. 2011;141(10):1847-54. 3 Rude RK. Magnesium. In Ross, AC, Cabellero B, Cousins RJ, Tucker KL, Ziegler TR, eds. Modern Nutrition in Health and Disease, 11th edition. Baltimore: Lippincott &Williams & Wilkins. 2014. p.159-89.